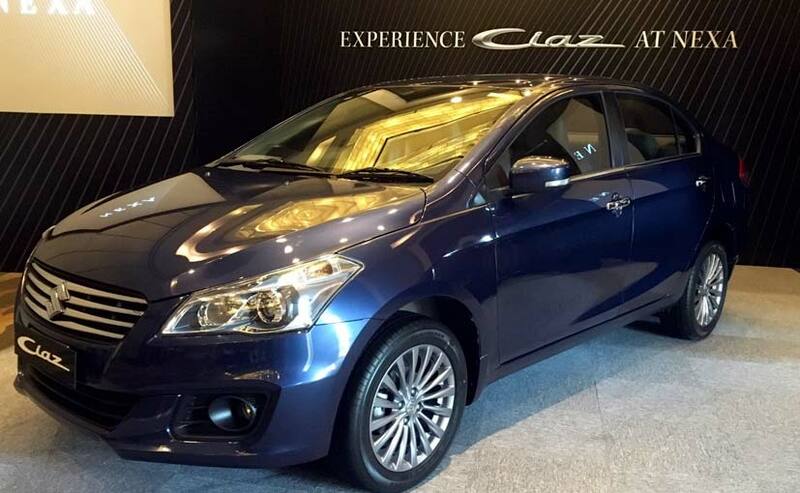 The 2018 Maruti Suzuki Ciaz facelift looks a lot more premium, offers a host of new and updates features and the older 1.4-litre petrol engine has been replaced by a new 1.5-litre smart hybrid petrol motor. 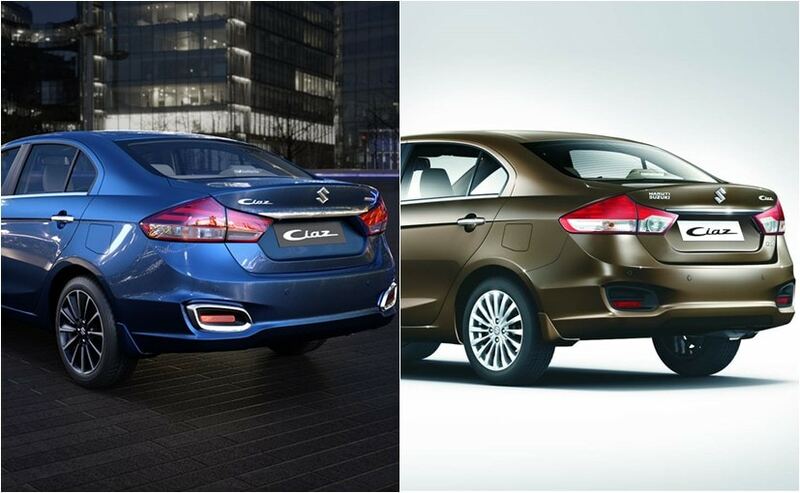 Maruti Suzuki has finally launched the mid-cycle facelift of its popular C-segment sedan Ciaz. Priced in the range of ₹ 8.19 lakh to 10.79 lakh (ex-showroom, Delhi) the facelifted 2018 Maruti Suzuki Ciaz comes to the market after over four years and also for the first time the car is featuring an all-new mild hybrid petrol engine. 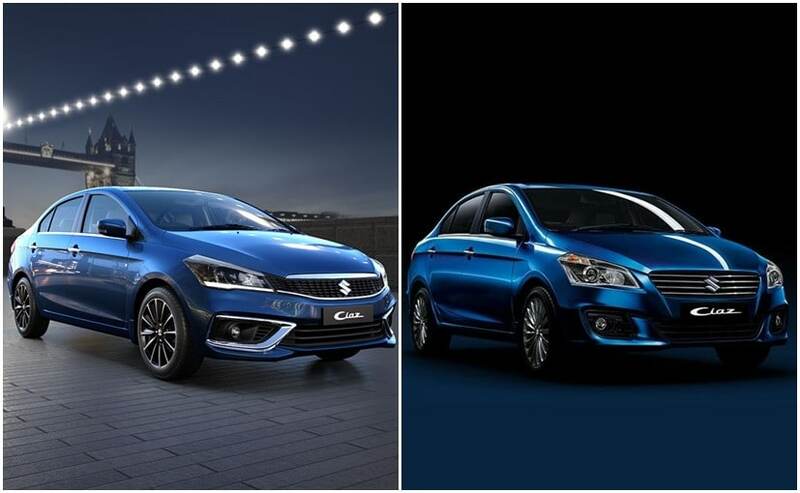 Compared to the pre-facelift Maruti Suzuki Ciaz, the 2018 model comes with a bunch of changes, both visual and mechanical, and here we have listed them down for you. Considering the car is just a facelift, most of the exterior change are mainly superficial, and the most evident one is the new face. Unlike the older model, which came with horizontal slats, the updated Ciaz comes with a new grille pattern with black studded elements with a sleek chrome underline and a fat chrome slat at the top. The grille is flanked by a pair of new sharper looking headlamps which feature both LED projector lights and LED daytime running lamps. Similarly, the 2018 Ciaz also gets an updated front bumper, with larger central air dam and new LED foglamps, bordered by the C-shaped metallic enclosure. The updated Maruti Suzuki Ciaz also comes with a set of new alloy wheels, while the rear section features restyled LED taillamps. In terms of dimensions, the overall length of the 2018 Ciaz facelift has been slightly reduced by 15 mm to 4490 mm, while the width, height, and wheelbase remain the same at 1730 mm, 1485 mm, 2650 mm. The boot space also remains unchanged at 510 litres. 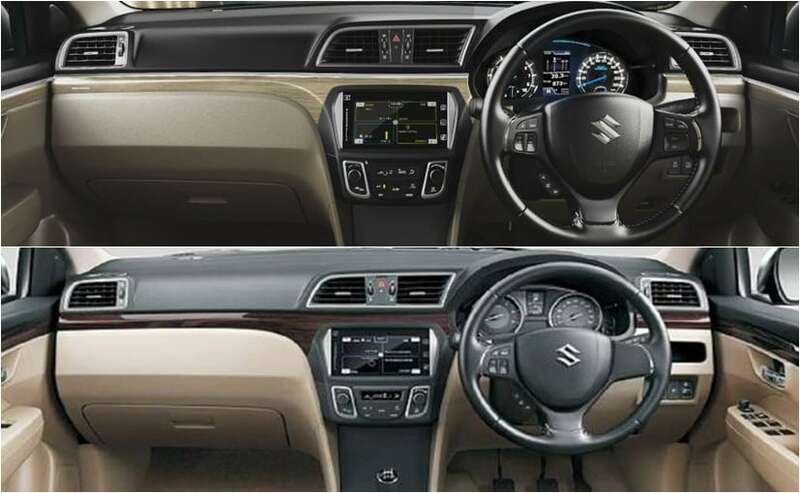 The cabin of the 2018 Maruti Suzuki Ciaz is largely similar to the pre-facelift model. In fact, the car continues to get the same beige interior and matching leather upholstery. However, there are a couple of changes worth mentioning like, the birch blonde wood finish with satin chrome accents and a new 4.2 inch TFT Multi-Information Display that shows the car's vital information. This includes fuel consumption, energy flow, trip details, driving range and gear shift indicator (MT). The rest of the cabin remains identical to the pre-facelift model. In terms of features, the car comes with a host of new and updated offerings. For starters, the top-end Alpha variant gets 16-inch precision cut alloy wheels, while the mid-spec Delta and Zeta trim get 15-inch silver alloys and the base Sigma trim gets steel wheels with wheel covers. Inside, the Ciaz facelift comes with an updated steering wheel as well which now features cruise control buttons on the steering itself. Other features, which have been carried over from the older model include -a touchscreen infotainment system with Apple Carplay and Android Auto, automatic headlamps, dual airbags, ISOFIX child seat mounts. The car also gets two new safety features like a seatbelt reminder for both driver and passenger and a speed alert system. 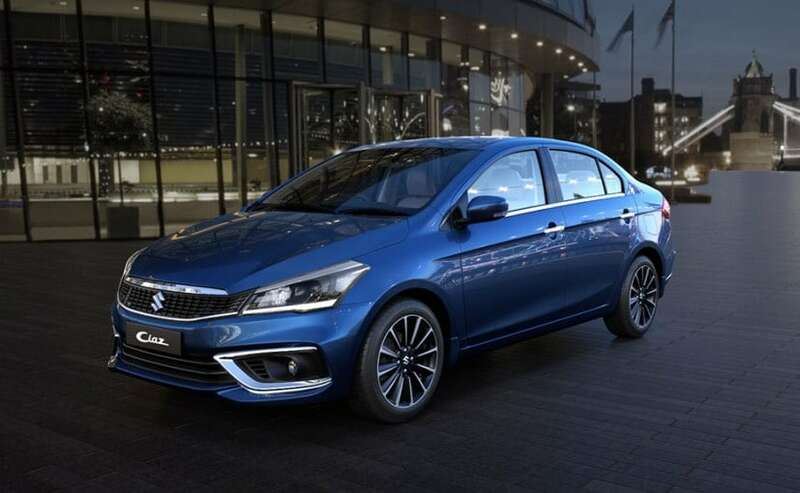 The 2018 Maruti Suzuki Ciaz comes with an all-new 1.5-litre petrol engine which comes mated to Smart Hybrid Vehicle from Suzuki (SHVS) system that replaces the older 1.4-litre petrol engine. The diesel variant, however, gets the same 1.3-litre DDIS diesel engine also equipped with the company's SHVS technology. The transmission options, on the other hand, remain unchanged offering the same 5-speed manual gearbox as standard, and an optional 4-speed automatic torque converter for the petrol variant. The 2018 Maruti Suzuki Ciaz is priced in the range of ₹ 8.19 lakh to 10.79 lakh, whereas the older model was priced from ₹ 7.83 lakh to ₹ 11.51 lakh (all ex-showroom, Delhi). So, although the price of the base model is over ₹ 36,000 more expensive, the top-end model is cheaper over by ₹ 72,000. This makes the car a value for money product compared to the pre-facelift Ciaz.